Buy this and your school gets £2.30 to spend on books Orders of £10 or more will earn 25% of your order value back in Scholastic Rewards for your school. To dream. To discover. To explore, learn and create. What higher purpose can humans aspire to? If you feel the same way, take a look inside these books, full of simple words to read – and great discoveries to get you inspired. What would it be like to set sail, long before the days of engines and Satnavs, to reach an unknown shore? There are no maps – you’re making the map! 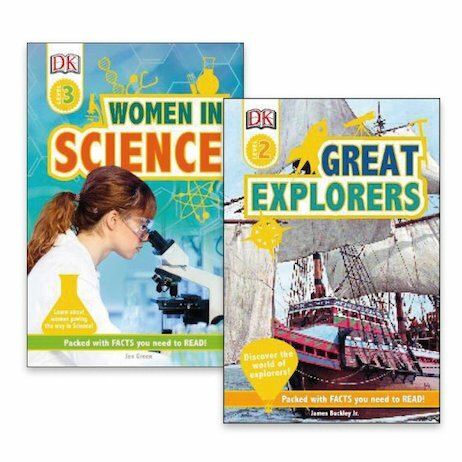 Discover the tales of famous explorers such as Marco Polo and Christopher Columbus, or the brave American aviator Amelia Earhart. Then it’s time to check out great scientific milestones made by women, including the first computer program and the first woman in space!